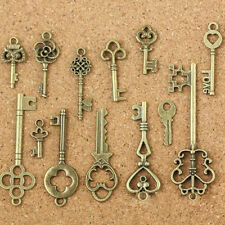 Un juego de llaves colgante (13pcs Keys colgante ). Tipo: Claves colgante. Características: Decoraciones de bricolaje, con encanto, Accesorios, Herramientas hechas a mano. Material Alloy. MPN Does not apply. Our keys always originate from a code cut key at depths that we test to work best (most often max depth or one depth higher.). We continually test, and inspect keys as they are cut to make sure they stay within the specifications. All keys are precision cut on a professional code cutting machine. The keys are cut to the lowest depth for each manufacturer specification. This is not a master key you can just use and be successful in the first try. Type: 10 in 1 Key Wrench. 1 x Cross Switch Wrench. Material: 45 # Steel. Product Weight: 140 G / 4.94 Ounces. - D 11-12(12mm,17mm). - C 8-9(9mm,15mm). 1x Old Look Skeleton Key Peadant. Color: Bronze, as pictures show. Item Specifics We will try our best to reduce the risk of the custom duties. Type: 10 in 1 Key Wrench. 1 x Cross Switch Wrench. Colour: See Picture. Port Size Included As the custom fees and policy are different in different countries, you'd better check it your custom office. But each of the keys are very nice. Color: Bronze. Inscribed with the text, numbers, variety. Heart-shaped, has a crown shape, hollow carved shapes. Can be used as decorative zippers, also be used as other hand-crafted creative DIY accessories. It is Multifunction, it can also be the practical wrench, to turning the screw. Colour: Silver. - It can be hang on the key ring for easy carry. Port Size Included 1 x Multifunction Cross Key. Hope you can understand. Colour: antique bronze. Fashion 128 kinds of Leaf Pendant Design. Detail Image. This key fits various locks by:Russwin, Bellnap Hardware, Fox Police Lock, International Products, Super Lock. This key fits various locks by:Corbin, Forward Lock, S.A.F.E. 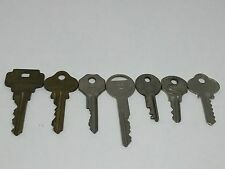 This set contains the following depth cut keys. You can install it in your jewelry box that displays your unique taste. 1 x Chinese Old Style Lock. Material: Zinc Alloy. Lock Spacing: 20mm/0.79". Quantity: 1 Set. It can be collected as collectibles, also you can use it actually. Set of 2 1960's VW keys. See pictures for more details. 1 x Heart Shape Padlock. Cute love heart shape, make your diary book or jewelry unique. 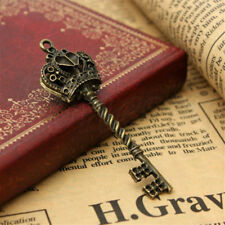 With this lock, you will not worry about your secret of your diary be breached. You can install it in your diary book or jewelry box etc. But each of the keys are very nice. Color: Bronze. Heart-shaped, has a crown shape, hollow carved shapes. Can be used as decorative zippers, also be used as other hand-crafted creative DIY accessories. Made from zinc alloy material with electrolytic polishing surface, it is durable and rust resistant. Material: Zinc Alloy. 4 way multi-functional universal cross key is a handy tool for plumbers, electricians and so on. Type: 10 in 1 Key Wrench. 1 x Cross Switch Wrench. Colour: See Picture. Port Size Included Material: 45 # Steel. Product Weight: 140 G / 4.94 Ounces. Our Support Team is Here For You! This key fits various locks by: Banner, Belnap Hardware, Black and Decker, Blaco, Crawford Door, Defiant, Donner, EZ Set, Fleur de lys, Fortress, HSC,Kwikset, Moss, Petco, Trey, Trojan, Troy. All keys are precision cut on a professional code cutting machine. 4 In 1 Universal Black Cross Cabinet Key Wrench Triangle Lift Maintenance Tool. It is Multifunction, it can also be the practical wrench, to turning the screw. 4 different keys, can open the toolbox doors, electric doors, especially suitable for the doors and windows of public places. LORD BUDDHA. BRASS MADE. THIS IS NOT JUST A "DECORATIVE PIECE" THIS IS WORKING LOCK. WORKING LOCK. ANTIQUE STYLE. Mix and match, personality DIY, create your own jewelry! Color: Bronze. Quantity: One bag of 19 pieces. Detail Image. All keys are precision cut on a professional code cutting machine. The keys are cut to the lowest depth for each manufacturer specification and the cuts are offset half of space to the tip of the key to ensure the best performance possible. Square Trick Puzzle Padlock. ITS VERY HARD AND COMPLICATED TO OPEN THIS LOCK.YOU WILL HAVE TO REMOVE THE BOTTOM BY USING KEY. WHERE YOU WILL FIND TO HOLE TO ENTER KEY.YOU NEED TO ENTER ONE KEY IN SIDE HOLE AND FULLY ROUND IT.AFTER FULL ROUND THE 2ND KEY.ENTER THE MAIN KEY IN FRONT KEY HOLE AND JUST ROUND IT AND THIS LOCK WILL OPEN. Vintage Brass Yale & Towne MFG Co Padlock Miniature Steamer Lock no key From Recent Estate Sale in Excellent Pre Owned Condition. Please view all photos for further details and description. Many other vintage and antique items listed regularly. Thank you for stopping by and taking a look. 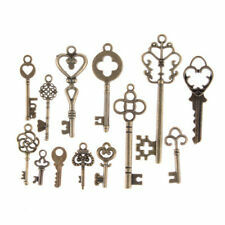 The original iron key was most likely a church key. 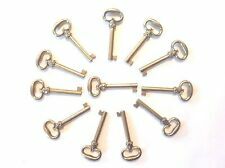 Great large reproduction cast iron key! The key is a brown black rust color. Nice heavy solid quality. Notice the cross in the center of the key handle. 4 different keys, can open the toolbox doors, electric doors,etc. It can be hang on the key ring for easy carry. Category: Key Wrench. Wrench Shape: Cross wrench. 1 x Cross wrench. Copper lock core. Type: Mini Lock. Material: Copper. 1 Mini Lock. Quantity: 1 Set. This can be for any of the following reasons -. Size: 2.8 1.8 0.6cm(L W H). You simply don't like your item. Apparently the fire that destroyed the wooden structure, conserved and preserved the iron object. 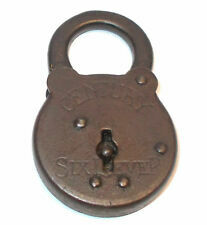 Iron padlock. Estimated to be 80-100 years old. Great to use as it was intended, or as a unique paperweight. 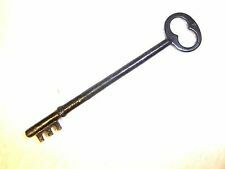 Great large reproduction cast iron key! The key is a brown black rust color. Nice heavy solid quality. For sale is a mixed lot of 22 padlocks and 25 keys. The keys are random keys and don't match any padlocks. Most appear to be brass. See photos for exact conditions.